Google latest move in real estate search – adding for-sale properties as a layer that can be turned on/off on Google Maps – could have a significant impact on how prospective buyers interact with listing inventory. It’s too early to say whether this is a game changer, but one thing seems clear to me today: Inventory matters. As an example of this, I queried Google Maps and an IDX driven Re/Max site powered by WhereToLive.com for homes in my zip code (55406). 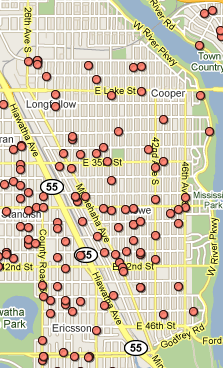 There are significantly more homes in the MLS than on Google today in my zip code. Google Maps displays a combination of listings provided by organized real estate and FSBOs yet still comes up short of what the MLS provides. However, there is probably enough inventory there to keep people from being immediately stumped and turning away from the search results. I happen to live in a market where a couple very large companies syndicate their listings to Google, so it’s possible that Google’s listing inventory could be significantly less in some markets. However, there are some real estate boards syndicating their entire MLS to Google, so Google would likely have more local inventory than organized real estate sites in those markets (since Google co-mingles MLS listings with FSBOs). 1. Do I benefit from syndicating listings? 2. Should I do it myself or go through a 3rd Party Syndication service. In some cases, this leads to traffic from Google sending people to the listing service’s website rather than your own. 3. Does this level the playing field vs. companies with lower quality brands and websites? 4. What branding benefits do I receive from this? 5. Is the data accurate and in sync in a timely manner? 6. Do sellers expect this? 7. Is someone already syndicating my listings, such as a national franchise? Where does that traffic go? 8. How does this effect lead flow? 9. Will this help or hurt my website’s traffic? 10. Will ads for my competition be served alongside my inventory? There may be other things to consider as well. We’d love to hear your thoughts on this evolving playing field in the comments. 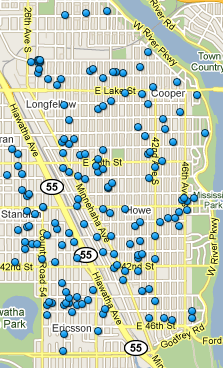 I am adding my lists to google map real estate. Some of them lists well, but the others not. Should I add Google Map to my web site for faster listing ?